The fruit and vegetable washing and peeling processing line consist of elevator, washing machine, peeling machine, blast cleaning machine, and conveyor picking line. 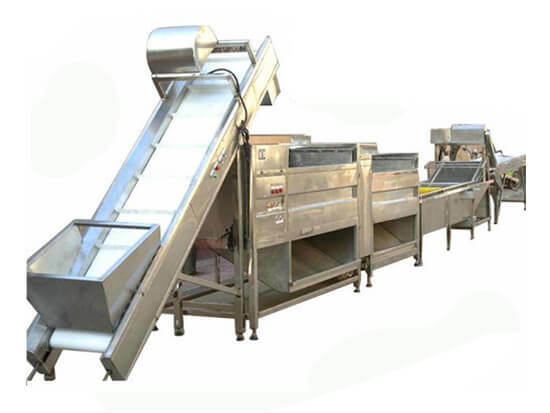 Fruit and vegetable washing and peeling processing line includes the following steps: Fresh fruit and vegetable--elevating--cleaning/washing--peeling--blast cleaning--picking. You can match with other fruit and vegetable processing equipment to do the deep processing. This kind of production line is easy to operate with high production, and it is the essential equipment for fruit and vegetable deep processing industry. 3. Peeling machine--it can peel the fruit and vegetable cleanly and automatically. 5. Conveyor picking line--the main function of the conveyor picking line is to separate the bad product and let the worker get it out. 4. Excellent product quality, peeled very clean and no damage to the fruit and vegetable. 6. We can custom-made the production line for you as your request. 1. Our fruit & vegetable washing and peeling production line is suitable for many kinds of fruits and vegetables such as potato, sweet potato, ginger, taro, apple, pear and so on. 2. It is widely used in vegetable processing factory, fruit processing factory, quick-frozen food factory, canning food factory, etc.